Clayton Capital Partners Announces the sale of a controlling interest in its client,Professional Environmental Engineers, to EnerGreen Capital Management and its Investing Partner, Gray Group Holdings. Clayton Capital Partners is pleased to announce the sale of a controlling interest in its client, Professional Environmental Engineers, to EnerGreen Capital Management and its Investing Partner, Gray Group Holdings, LLC. Professional Environmental Engineers (www.pe-engrs.com), based in St. Louis, MO, is a full-service engineering and consulting firm that specializes in providing cost-effective environmental solutions to both the government and commercial industries. EnerGreen Capital Management (www.energreencapital.com), a private investment firm that provides capital, along with strategic management expertise, to Middle Market Companies in the Environmental & Energy Market Segments. 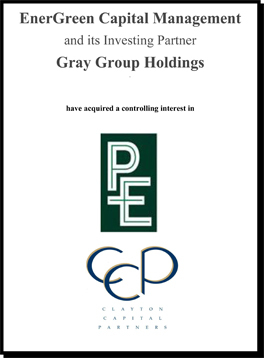 Gray Group Holdings (www.graygroupllc.com) is a private investment firm focused on the acquisition and development of Middle Market, growth-stage companies in the Infrastructure, Energy, and Industrial sectors. Clayton Capital Partners (CCP) is one of the nation’s top investment banking firms providing financial advisory services to a diversified client base of middle-market companies. Clients have come to rely on our expertise, our commitment to client services and our innovative ability to create value. The principals at Clayton Capital Partners focus on satisfying the complex needs and objectives of our clients through our core business practices – Exit Planning and Investment Banking. Together, our professionals have acted as financial advisors in more than 200 advisory transactions. If you would like more information about this transaction or Clayton Capital Partners, please contact Brent Baxter at (314)725-9939 x 526 or via email at bbaxter@claytoncapitalpartners.com.